Have you ever had a card idea that went south within minutes after you began the project? Well, that's what happened with my project for this week. One which I was absolutely sure would come together with no problems....boy, was I wrong. So, rather than keep re-doing the same idea I changed direction....from my collection of TJ stamps I picked three of my favorites and went in another direction...and I'm happy I did. These stamps (and all other stamps in the TJ Store) are available to you, if you'd like to purchase them, with a 10% discount if you use my personal discount code of TJ10CHERI. 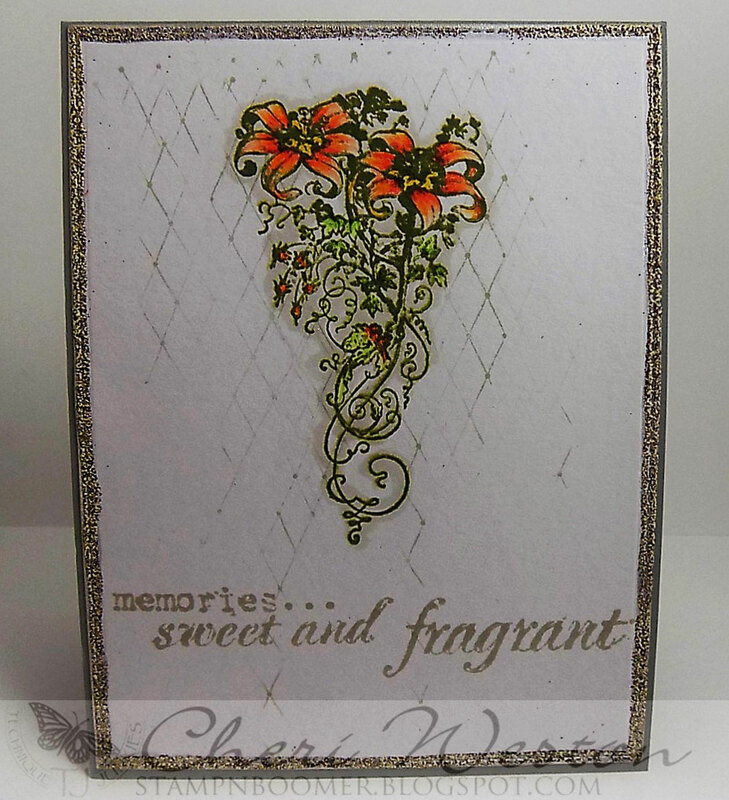 To create this card I used "Lily Spay", "ATC Dotted Harlequin" and a sentiment from "Sentimental Sayings". The coloring was done with my Chameleon ColorTone Pencils. The image was first stamped in a dark green dye ink. After coloring, I partially inked the harlequin stamp with a medium gray dye ink and off stamped it before bringing it to the panel. 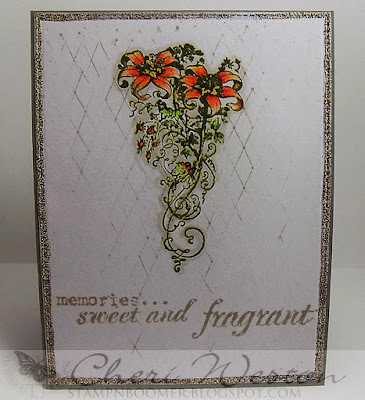 This stamp gave additional texture to the background and was just the right touch. The sentiment was stamped in the same gray color as the harlequin stamp. Before placing the panel on a card base of darker gray, I used my VersaMark pen and heat embossed more textured ep around the outside edge. I hope you found some inspiration here today. Don't forget to check out our new challenge...it's about making Artist Trading Coins. You could win some awesome TJ stamps if you play along with us. The details are on the challenge post. 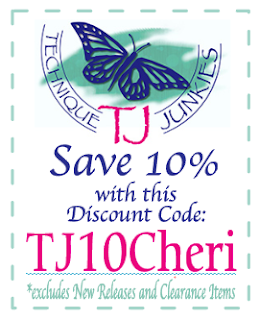 One more time, here's my discount coupon for you to use on your shopping trip the Technique Junkies Store. Have fun! Simply beeeeeeeeeeautiful SS. That harlequin background is fabulous. Just the right amount of texture and that Lily is coloured amazingly. Love the gold embossed edge. Another spectacular card.